CHAPALA, Jal. - The Titanic sets sail from the main pier in this municipality on the north shore of the country's largest lake, taking passengers on excursions to nearby Scorpion Island. But earlier this decade, boarding the 12-person "lancha" - as such boats are locally known - wasn't easy. 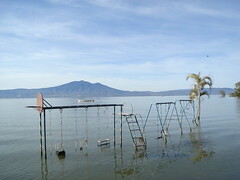 A precipitous decline in Lake Chapala's water level left the shoreline far away from the pier. Passengers had to board buses just to reach the departure point. Few bothered to show up, recalls Titanic captain Ramón Montes. Today, however, he says he's making more trips than ever - at 200 pesos a boatload - thanks to a recovery in Lake Chapala's water level. "There are at least 10 times as many passengers as there were six years ago," he said while docking at the Chapala pier. Within five minutes, his lancha filled up, and he was off to Scorpion Island again. Six years ago, Lake Chapala was drying up - the lake's volume had receded to less than 20 percent of its capacity. The situation was so serious that some locals feared the level would never completely return to normal. Some in the ex-pat population fretted about low water levels hurting local property values; others who work in tourism and fishing figured their livelihoods would never bounce back. "All you'd ever hear was that [Lake] Chapala is dying," said innkeeper Michael Eager, whose family runs La Nueva Posada in Ajijic, a village in the Lake Chapala area. But some refused to give up on their lake. A local advocacy group organized events such as "hands around the lake," participated in forums and raised awareness. Politicians, too, promised action - in 2006, presidential candidates Felipe Calderón and Andrés Manuel López Obrador said that they would save the lake - but little concrete action was taken. That fueled conspiracy theories of unscrupulous politicians deliberately starving the lake to make other public works projects more saleable. Other residents ignored politician's promises, and looked instead to divine intervention. Local Catholics pleaded with a revered local religious icon to save the lake; the indigenous Huichol, who consider Scorpion Island the southernmost point of their territory, said one of their gods was angry. Then, almost serendipitously, the lake started filling up. In 2003, the water level climbed more than three meters during the annual rainy season. It continued climbing in subsequent rainy seasons, as upstream dams were unable to hoard any more water and spilled excess toward Lake Chapala. In 2008 alone, the water level rose more than two meters and swelled to more than 80 percent of full capacity. Locals haven't forgotten just how grim the Lake Chapala situation was just a decade ago. With the shoreline receding, farmers invaded the dried-up lake bed, using the land to plant crops ranging from agave to zucchinis. They built fences around their fields and dug wells. Some even raised cattle on what once was lake. Locals still tell stories of baseball diamonds, racetracks and playgrounds being built. The number of tourist visits also dropped along with the water level, especially in the town of Chapala, located 40 kilometers south of Guadalajara. "The lake was completely forgotten," said Eager, whose business is now usually full of customers from the Guadalajara area. Extreme fluctuations in water levels are nothing new for Lake Chapala, which is mainly fed by the Lerma River. The most recent crisis was not even the worst fluctuation, according to the National Water Commission, or Conagua. The water level dropped to barely 17 percent of its normal capacity in 1955. But just three years later, it recovered to the point that water splashed over the Chapala pier and flooded the local parish, famed for its twin spires. "There have always been ups and downs," said Eugenio García, Conagua spokesman in Guadalajara. "When the Chapala [water levels] fall, it's due to hydrological cycles." Environmental groups and scientists partially agree, but they blame many of the lake's woes on issues beyond capricious weather patterns. Unseemly political maneuvering by Jalisco and federal lawmakers is one bone of contention, as is water management along the Lerma River, which flows from the State of Mexico through five states before emptying into Lake Chapala. Problems upstream in the water basin are said to be rife. Agricultural and industrial users have been accused of having priority over those who live downstream in the villages by Lake Chapala. Upstream farmers are said to withdraw vast quantities of water for irrigating crops that include corn, sorghum and strawberries, while agricultural runoff pollutes the river. Discharge from industrial operations in the State of Mexico and Guanajuato - home to a refinery - add to the contamination, say environmental groups and scientists. Further complicating matters, they say that more than 3,000 dams in the basin were hoarding water, mainly for agricultural users. State and local governments have also bickered over sharing water. But García said the upstream situation changed earlier this decade with the signing of a water-sharing agreement by the federal government and the governors of the State of Mexico, Querétaro, Guanajuato, Michoacán and Jalisco. In years prior, García said that the dams would routinely hold back any additional water beyond the amount that had been authorized by Conagua, but the new agreement mandates that any excess be sent onward toward Chapala. Still, many academics and environmental groups dismiss the government's role in rescuing Lake Chapala. Some say that the main Lerma River dams were filled, and thus couldn't hoard any more of the runoff from heavy precipitation in the basin. "It was nothing more than heavy rains," said Alicia Córdova, an adviser to Amigos del Lago, a lake advocacy group. "There were [water-sharing] agreements, but they weren't respected." "In 2000 and 2002 there were ... torrential rains for filling the lake, but the water wasn't allowed to reach Lake Chapala," he said, adding that recovery only really began after uncertainty over the construction of the dam diminished. Whatever the exact reasons for the rebound, the rise in water levels caught many by surprise. The water level rose so quickly in 2008 that farmers reportedly tried using canoes to salvage their floating crops. One ejido to the east of Chapala had 400 hectares of farmland swallowed by the rising waters. In the community of San Juan Cosala, parts of a new waterfront development built by the municipal government - but built too low - were flooded out. The rising water also flooded out a soccer pitch and playground near the Ajijic shoreline, where fisherman Toño López docks his boat. Today, goalposts, a swing set and several trees poke out from the water. Farmers who grew crops on the lake bed were also flooded out. López has no idea where the farmers who swooped in when water levels declined originally came from, or where they went. But he vividly recalls them trying to board canoes last summer in an attempt to salvage their suddenly waterlogged crops. "The rising water completely caught them by surprise," he said. López said underwater obstacles - fence posts and barbwire left by the farmers, for instance - still present boating hazards. But he's not complaining; he's more than doubled his daily catch of "tilapia" and "charales." Like many in the area, he once thought the source of his livelihood was going to disappear. "No one knew if the water would return - only God," he said. The religious groups who once pleaded for divine intervention certainly credit what they asked for. Catholics in the area are currently contemplating honoring the Virgin of Zapopan with the title "Queen of Lake Chapala" for answering their prayers. The Huichols, meanwhile, regularly return for ceremonies at their sacred body of water. But some residents remain cautious about Lake Chapala's comeback. Córdova, the Amigos del Lago adviser, said that pollution in the lake remains a serious concern, for instance. "There are still many challenges," she said. We first visited Lake Chapala in Spring of 2001. Since that time it has made a miraculous recovery as you outlined in your blog post. Viva Mexico! Viva Lake Chapala!